The most powerful version in the R-36M family of rockets was designated in the secret Soviet documentation as R-36M-2 and also known under its military name RS-20V Voevoda (an archaic Russian word for "military chief"). This truly monstrous rocket could carry 10 half-megaton warheads up to 11,000 kilometers, where each could strike within 500 meters of its intended target. 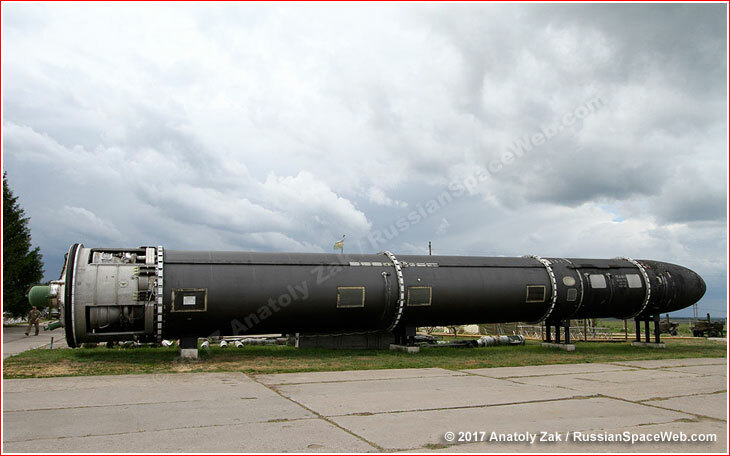 According to some reports, the missile of this type could carry between 14 and 19 warheads and even as many as 20. The R-36M-2 had been under development since June 1979. In March 1982, KB Energomash completed a preliminary design of the RD-274 engine, which would power the first stage of the missile. The Soviet government gave a green light to the project on August 9, 1983. The flight testing of the missile started on March 21, 1986 and continued until September 1989. The first detachment of the R-36M-2 missiles was declared operational on July 30, 1988 at a missile base near the town of Dombarovskiy. As many as 58 such missiles were reportedly deployed by 1989. Total 308 missiles of the R-36M family were believed to be deployed -- the absolute maximum allowed by the US-Soviet arms limitation treaties. With the end of the Cold War, the R-36M-2 missiles, designated in the West as SS-18 Mod 3 or 4, became the subject of strategic arms control negotiations between the USSR and the US. The previous SALT I treaty reached in the 1970s permitted the USSR to deploy 310 of such missiles. In the meantime, under contract from the Russian Ministry of Defense, KB Yuzhnoe worked on extending operational life span of its former "product." In cooperation with TsNII-4 research institute of the Ministry of Defense, engineers certified the R-36M missiles for 15, 18 and ultimately, 20 years in service. In May 2005, Nikolay Solovtsov, the commander of the Strategic Rocket Forces, said that R-36M2 missiles would remain in service until 2014-2016. In June 2009, Solovtsov disclosed yet-to-be-approved plans to develop a Russian-built version of the Voevoda missile. In January 2012, the head of the Ukrainian space agency, NKAU, Yuri Alekseev said that the press-conference in Kiev that 52 battlefield missiles had remained in operational readiness in Russia with Ukrainian contractors participating in their service and maintenance. Russian Strategic Missile Forces, RVSN, launched its largest Intercontinental Ballistic Missile, ICBM from an operational base in the south of the country. The R-36M-2 Voevoda missile, capable of carrying 10 warheads, blasted off from a silo facility of the 13th missile regiment deployed near the town of Dombarovka in Orenburg Region at the border with Kazakhstan at 11:30 Moscow Time on Wednesday, December 22, 2004. The missile headed in eastern direction toward the Kura impact site in the Kamchatka Peninsula. 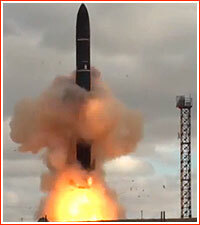 The Russian government reportedly allocated a slot of uninhabited marshy land in the Vagai, Vikulov and Sorokin Districts of the Tyumen Region as the impact site for the first stage of the missile. Colonel General Nikolai Solovtsov, the commander of the RVSN, personally attended the test. The R-36M-2 Voevoda is the most advanced missile in the R-36M family. As a number of previous launches, the latest mission was intended to certify the R-36M-2 missile for extended period of operational service, currently reaching 20 years. At the same time, the decision of the Russian government to move such launches from a test site in Baikonur Cosmodrome, Kazakhstan, to an operational base aims to validate the use of such facility for commercial space launches, beginning in 2005. As many as six orbital launches, of the converted R-36M ICBM designated Dnepr could earn estimated $40 million for the cash-strapped branch of the Russian Armed Forces. Kosmotras joint venture, marketing Dnepr to commercial customers, hopes to use the launch facility near Dombarovka for launches in southern direction to reach polar orbits. 2006 Dec. 21, 11:20 Moscow Time (8:20 GMT): Russian Strategic Missile Forces, RVSN, launched the R-36M-2 missile from Dombarovskiy. A spokesman for the Russian Strategic Missile Forces, RVSN, said that the vehicle successfully reached its target on the Kamchatka Peninsula. The particular missile was in service for 19 years. 2009 Dec. 24, 09:30 Moscow Time: Russian Strategic Missile Forces, RVSN, launched the R-36M-2 missile, apparently from one of the silos near Dombarovsky. A spokesman for the Russian Strategic Missile Forces, RVSN, said that the vehicle lifted off from an operational deployment area in Orenburg Region and its reentry vehicles hit their targets at Kura impact range in Kamchatka Peninsula. 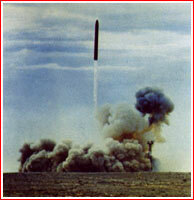 The purpose of the flight was to certify the Voevoda-type missile complex for the 23-year operational life span.